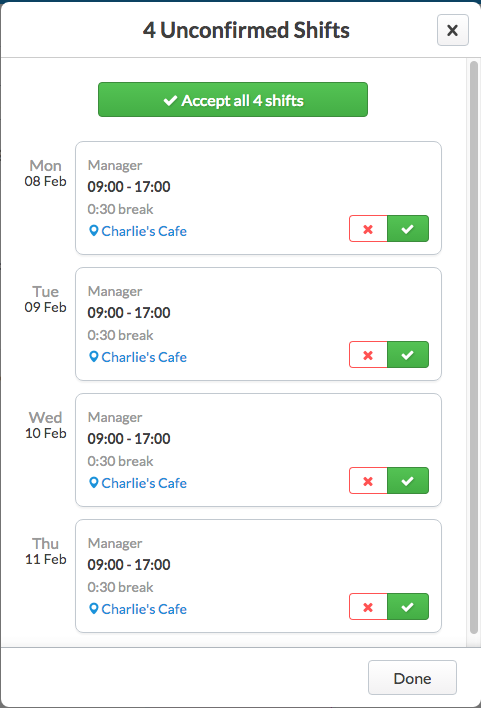 This feature ensures that employee is informed about a shift assigned to them, and confirms that they are able to work it. 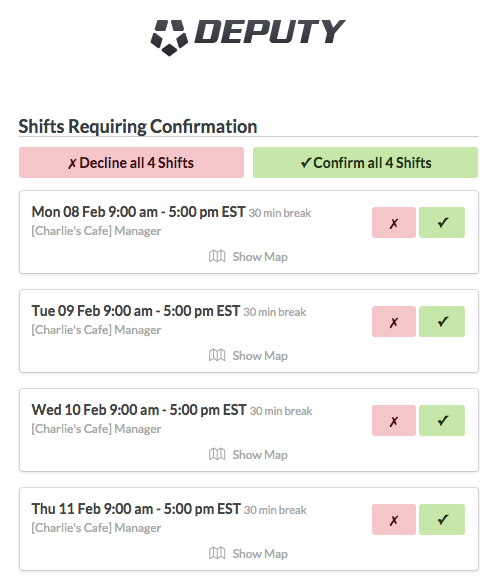 Confirmation is an optional way to publish your shifts. 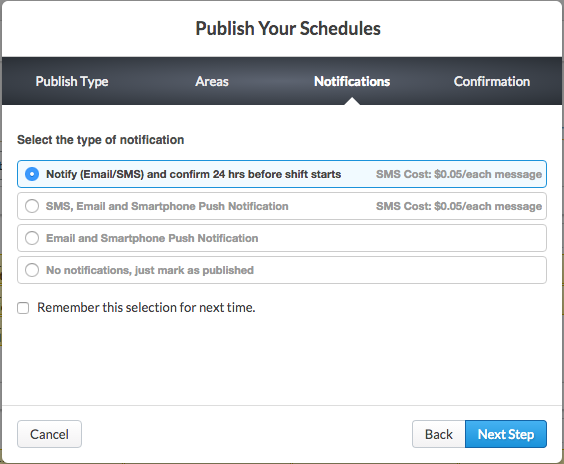 When you publish a shift with confirmation required, the employee assigned to the shift will be sent an email and SMS, and must either accept or decline the shift. By default, they must have confirmed the shift by 24 hours before it begins, however this may be changed in "Scheduling", found within your Location Settings on the Home page (Locations tab->Edit Settings->Scheduling). If an employee does not confirm the shift by then, the shift will become an Open Shift. If the shift is confirmed, the employee will remain assigned to it, which will appear the same as a normal published shift. If they decline the shift, you will be notified and the shift will appear as "DECLINED" on the roster. If an employee has a phone number attached to their account, they will be sent an SMS message to confirm, as well as an email. How Do I Use Shift Confirmation? Requesting confirmation is simple. First, please Schedule your shifts as you usually would, then click "Publish". Next, please follow the steps to publish either updates or the full roster, then select your areas as usual. On the next step "Notifications", you will see at the top the option to request confirmation. Finally, please click "Next Step", after which you will be asked to confirm that you want to publish. Click "Publish" to complete the process. On the roster you will now see that any shifts requiring confirmation have a yellow earmark on them to differentiate them from regular shifts. 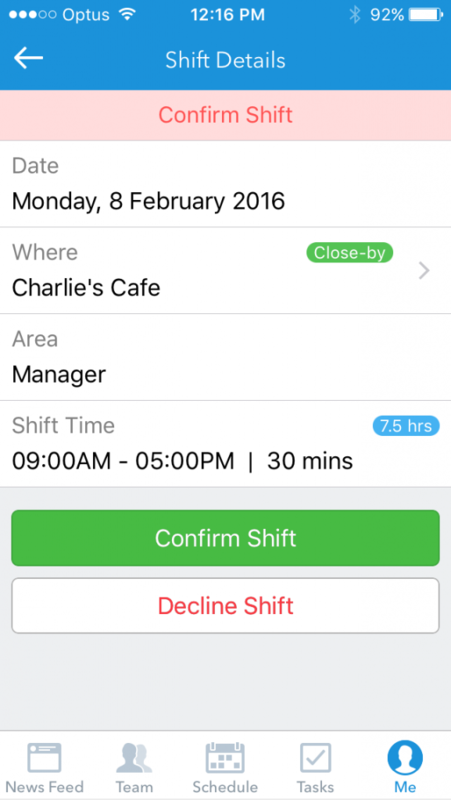 Your employees will now need to confirm the shifts. There are a few ways to claim your published shifts. You can confirm via web browser (Me tab), confirm the shifts through your emails, or you can confirm them through the iOS App. For instructions on each, see below. To confirm your shifts on the web, first please log in. Next, navigate to the Me tab. Here you will see "Upcoming Shifts", as shown below. 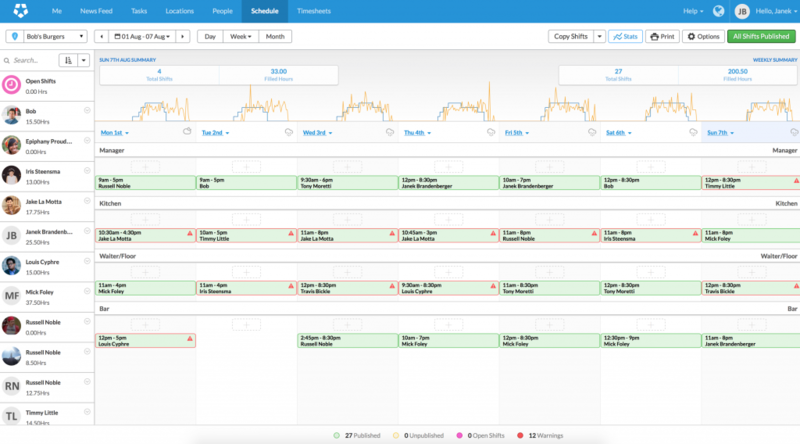 Click "Upcoming Shifts" to display shifts that require your confirmation. You may need to scroll down to see them if they are in the future. 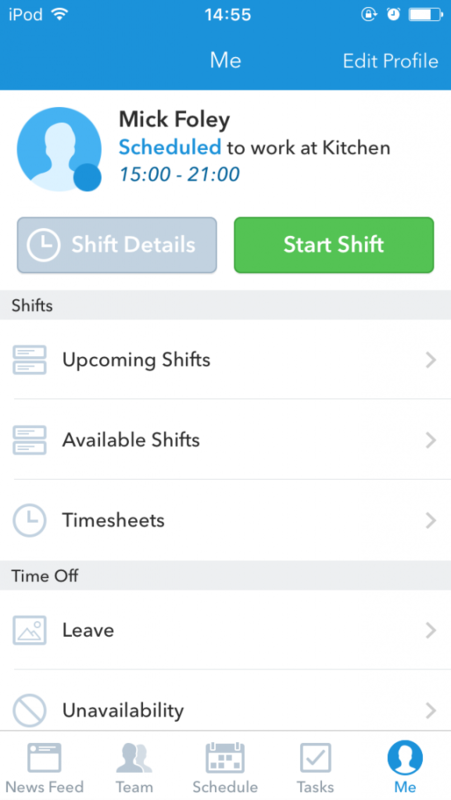 Next to shifts requiring confirmation you will see a tick and a cross next to the shift. Click the tick to confirm, or the cross to decline. Please note, if you decline the shift you cannot confirm it afterwards. 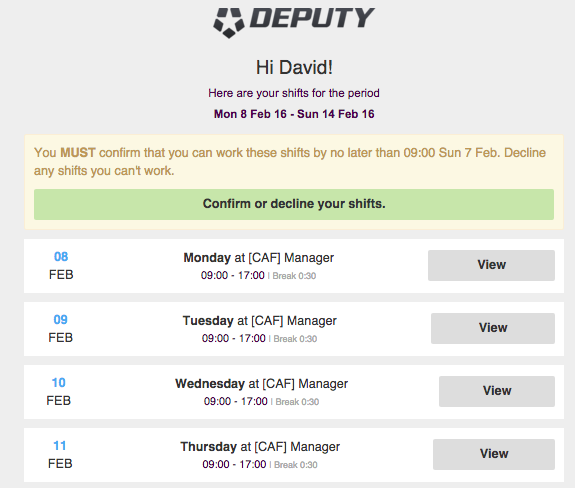 To confirm shifts through email, first navigate to your inbox and open the email containing the shifts. Click the button at the top reading "Confirm or Decline your shifts". The link will display another page where you can confirm or decline the shifts. Click the tick icon to confirm the shift or the cross icon to decline it. If you decline the shift you cannot later confirm it. To confirm or decline shifts through the iOS App, first ensure you have downloaded the latest version. Go to the Me tab, then click "Upcoming Shifts". You can confirm all shifts from this page, or to confirm a particular shift, first tap the shift to open the shift details, then click to confirm or decline the shift. If your phone number is entered into Deputy, you can also confirm shifts via SMS. To do this, simply reply to the shift confirmation SMS with the unique confirmation code.